I love Octopus. I love Octopus in Greek restaurants especially where they tenderise it, cook it over piping hot charcoal and drown it in lemon juice and olive oil. I love Pulpo a la Gallega, boiled with vinegar, salt, bay leaves and onions and served on hot potatoes with a sprinkle of paprika and some olive oil. I once had a job in Santiago de Compostela cooking this dish in a big cauldron on the street at the front of a restaurant. It was a nice job spooning it onto the plates and watching happy pilgrims slurp it down, but I only lasted three days in the job. Porqué? I had to get to the restaurant before 7 am to prep the octopus. This process consisted of strapping on a heavy duty red pvc apron that was at least two sizes too big, slicing off the tentacles (these suckers were pretty big and weighed at least 1.5 kgs each, their tentacles were about a metre long), picking them up one by one and whacking the tentacle half a dozen times on the bench. I tried doing two at once, one in each hand but I felt like an insane Don Quixote tilting at windmills, whirling tentacles in the most uncoordinated, inexperienced way. They weren’t ALL really really slippery! I would invariably have stayed up until at least 1am the night before, and as an 18 year old back packer I could think of lots of other things I would rather do at 7 am like, oh I don’t know, sleep. There were sometimes 10 or 12 of these Octopus requiring a battering, so thankfully I wasn’t the only person enlisted for the silly job. However, at that stage my Spanish was limited, and as if holding a conversation while repeatedly hurling octopus tentacles over your shoulder and down to the bench top (with a very loud) WHAP wasn’t hard enough WHAP as it is, WHAP language barrier aside WHAP. I quit. Baby Octopus doesn’t require tenderising. Phew. The marinade/sauce for this stir-fry is incredible – tangy, sweet and spicy and you could use it with just about anything at all. It’s kind of Thai style but of my own design, so let’s not call it real Thai. From left: Tamarind (block), dried chilli flakes, Thai soy sauce (Healthy Boy brand), Thai chilli and soy bean paste (Pantai brand), fish sauce. Front: garlic, lime, fresh red chilli, palm sugar. 2-3 cups vegetables such as green beans, capsicum, eggplant, but anything you like would be fine! Marinade the octopus for about an hour (2 if you like but it won’t make much difference). First, stirfry the vegetables in a little oil and set aside. 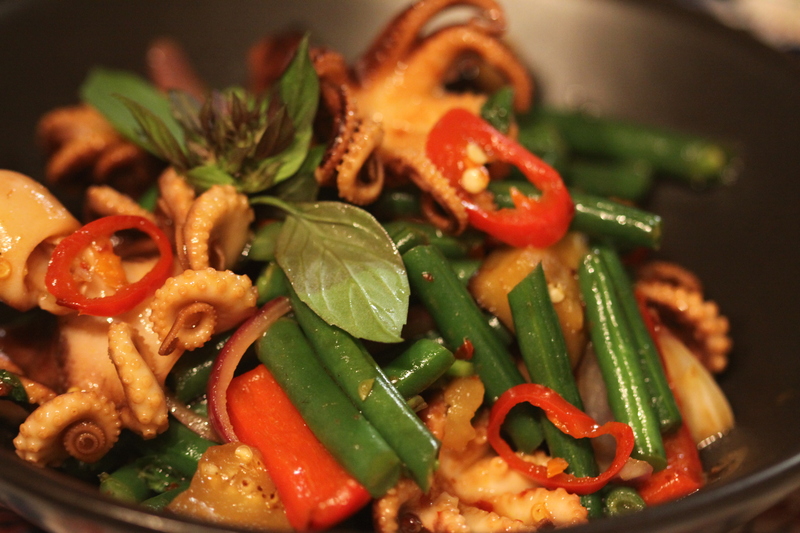 Strain the octopus (reserving the marinade) and fry in a little oil in a very hot wok for just 2 minutes. Remove and set aside. Pour the marinade into the wok and reduce by 1/3, thicken with a little cornflour and water. 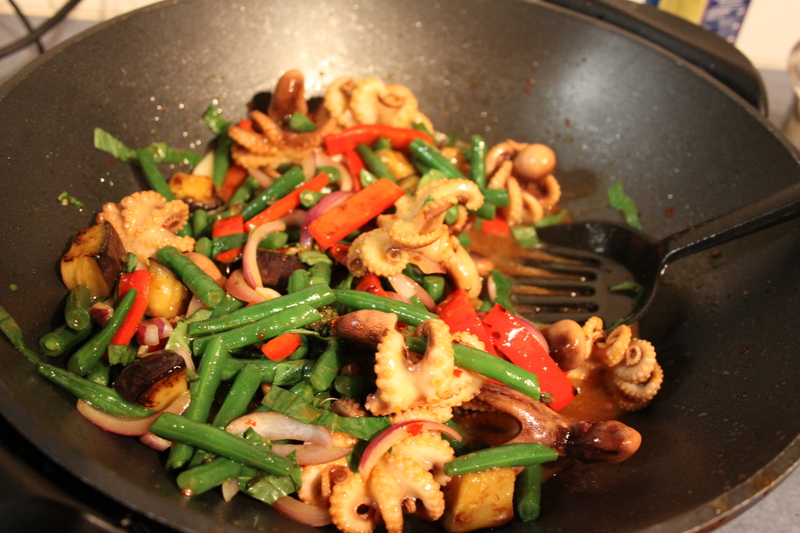 Return the veg and octopus to the wok and toss through the sauce. Garnish with chopped Thai basil and serve with steaming hot, fragrant Jasmine rice. Tamarind is yummy. It comes in different products. I buy it in a ‘brick’ which is just Tamarind pulp and seeds (straight from the pods) compacted. You need to make a sauce by adding boiling water as I described above. 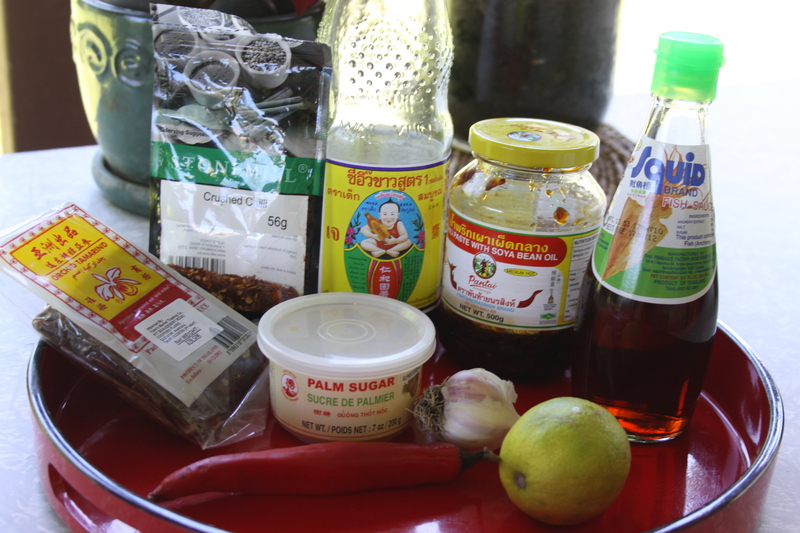 You can also buy Tamarind paste, which you use straight out of the container. It’s tastes almost as good as the non-processed stuff but it often has additives I don’t like. You can buy it in good supermarkets or in any Asian grocer. Dare I say this stir-fry would be even better with big, fresh, firm prawns. You could also use any meat or seafood (perhaps not Mussels) with this sauce. Depending on the size of the octopus you may wish to slice them in half, a large-ish one can be quite a mouthful. 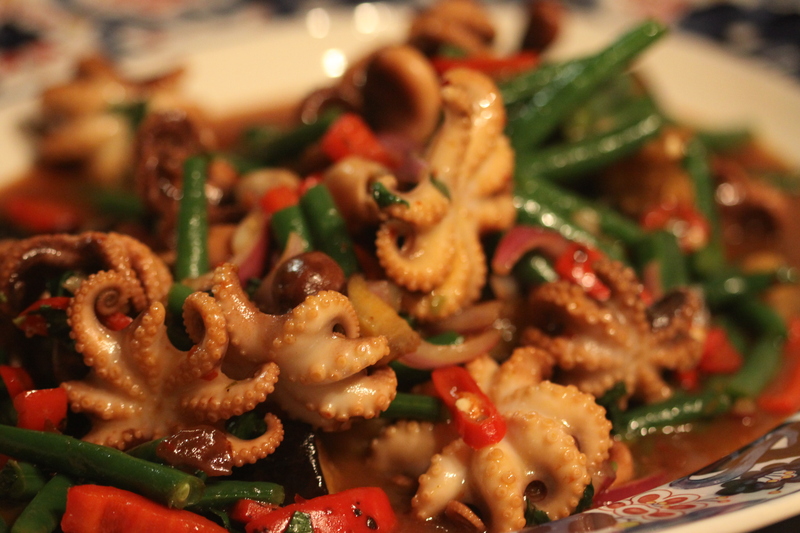 Don’t overcook them, this is how you get tough octopus. If you don’t trust yourself, boil the octopus for about 45 minutes before you marinade it (cool it down first) and you’ll have tender octopus guaranteed, but this isn’t really necessary. If 3 chillies sounds scary just leave them out. The soy bean chilli paste is pretty mild – try some before you add it in, it’s quite sweet and about as hot as commercial sweet chilli sauce.